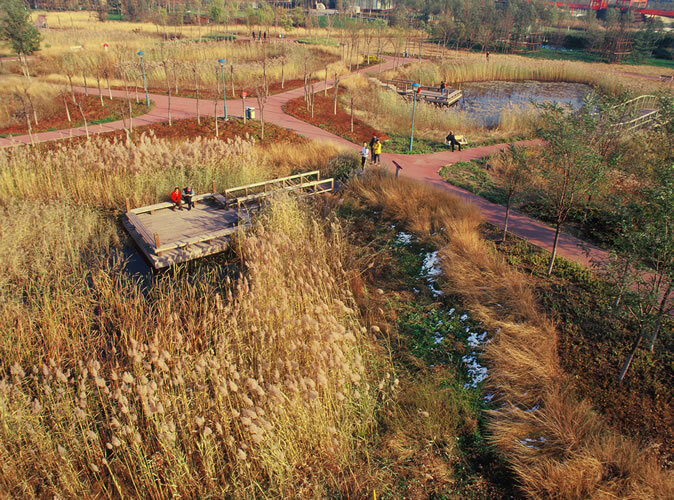 In the Chinese city of Tianjin, the strategy of “adaptive palettes” was used to create a series of biologically diverse ecosystems that could repair contaminated soils and treat urban stormwater by relying on nature’s processes. 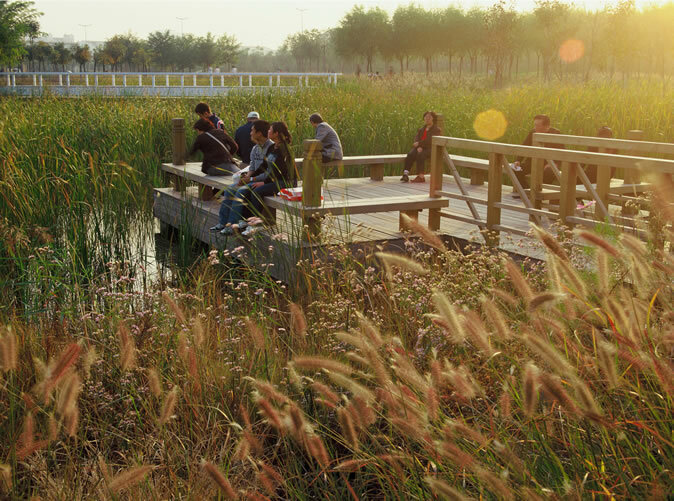 Today, Qiaoyuan Park has reclaimed a brownfield by integrating regenerative ecological functions, using native plants in a landscape that is allowed to adapt and evolve, and educates visitors in a relaxing recreational space designed for the dense community surrounding the park. Notice: This article is a reprinted version with the official permission of the author. Do not copy without permission. Article Source: Kongjian, Yu. 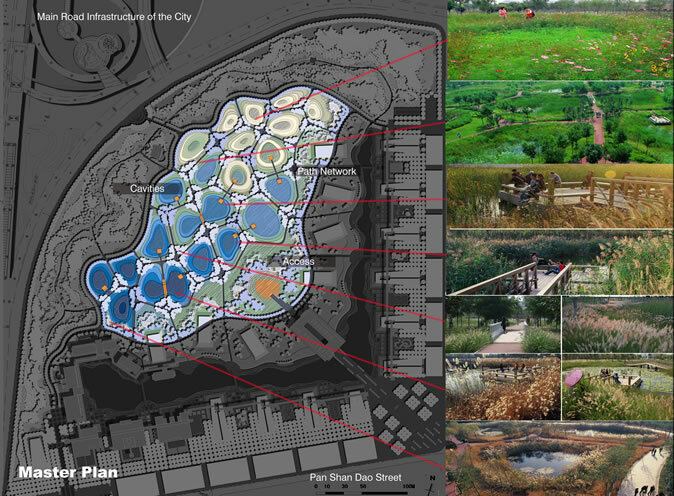 Qiaoyuan Park, An Ecosystem Services- Oriented Regenerative Design. TOPOS, VOL. 70. June, 2010. China’s rapid economic growth and urbanization often raises questions about the sustainability of projects that seem to go up overnight (Shannon, 2009). In a country where space is at a premium, open space in urban environments is typically subsumed to make room for the influx of residents. 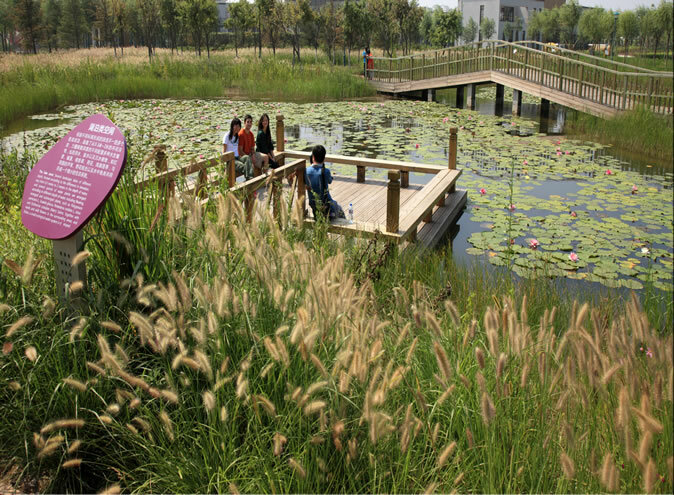 The lack of readily available resources combined with rapid urbanization gives rise to more sensitive environmental approaches and China is well-positioned to lead the way for responsible sustainable urban development and restoration. Green space has historically been an asset because of the psychological and physical benefits to the surrounding community. The reality of many traditional urban parks, however, particularly those built within the last 20 years, is the economic and environmental burden they present to the city through maintenance, repairs, and water and energy consumption. 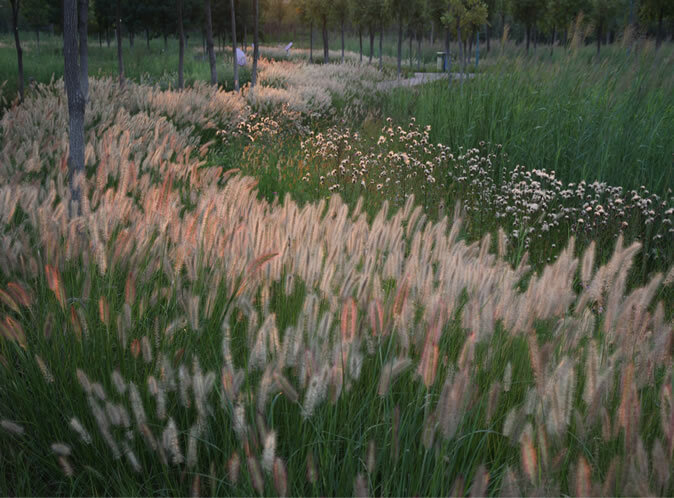 While the beauty of traditional ornamental parks has been appreciated, the more authentic and vigorous “beauty of wild grass”(Yu, 2006, 2009; Yu and Padua,2007) of vernacular landscapes is undervalued, especially in terms of the sustainable services they provide. Storm water management, including minor flooding, is often seen as a threat to urban progress. Slow moving streams and rivers were straightened and channelized to move water efficiently, resulting in the loss of groundwater supplies and the availability of potable water around the world. Native plants have been replaced with mass swaths of ornamentals that lack biodiversity. Taming nature’s messy ecosystems into more sophisticated urban parks has all but removed nature’s ecological benefits. 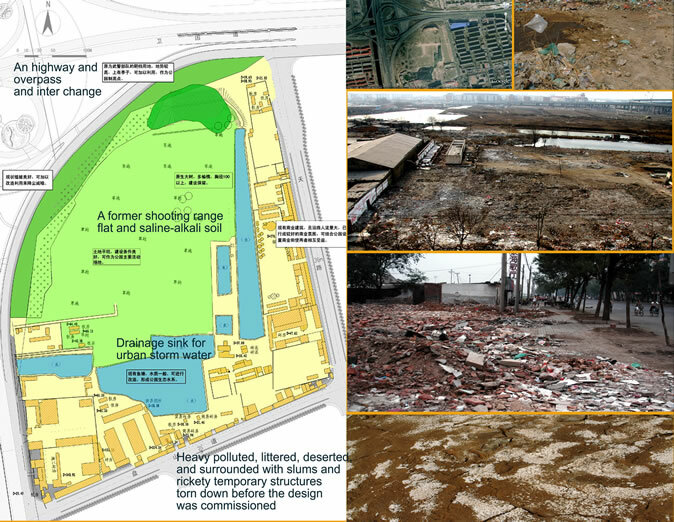 Figure2: The existing conditions of the site: a former shooting range, shown as a garbage dump and drainage sink for urban storm water, heavy polluted with saline-alkali soil, littered, deserted, and surrounded with slums and rickety temporary structures. As engineering and mechanized services have been standardized throughout the urban world, natural systems have been severely degraded or completely destroyed. When an ecosystem is no longer sustainable, it is forced to rely on human control for services such as water and wastewater treatment, food production, habitat protection, and rehabilitation. When the ecosystems are damaged, the environment becomes sterile, blighted and/or contaminated and requires human intervention to repair it. We often find ourselves approaching the problem with nearly the same solution that caused it. We create new public spaces with neatly placed shrubs and treat contaminated water and soils using mechanical methods, and celebrate a restored environment. The contamination is addressed but at a significant expense to the government or people, and the environment is still incapable of self-sustenance. It is therefore critical to recover landscape as a living ecosystem that has the ability to adapt, change, and providing ecosystems’ services including: Provisioning services (including food, water and energy) ; Regulating services (such as purification of water, carbon sequestration and climate regulation, waste decomposition and detoxification, crop pollination , pest and disease control); Supporting services (such as nutrient dispersal and cycling, seed dispersal and Primary production); and cultural services (including cultural, intellectual and spiritual inspiration, recreational experiences, ecotourism and scientific discovery) （Constanza and Daily，1992; Constanza, et al. 1997; Daily 1997, Millennium Ecosystem Assessment (MEA) , 2005）. 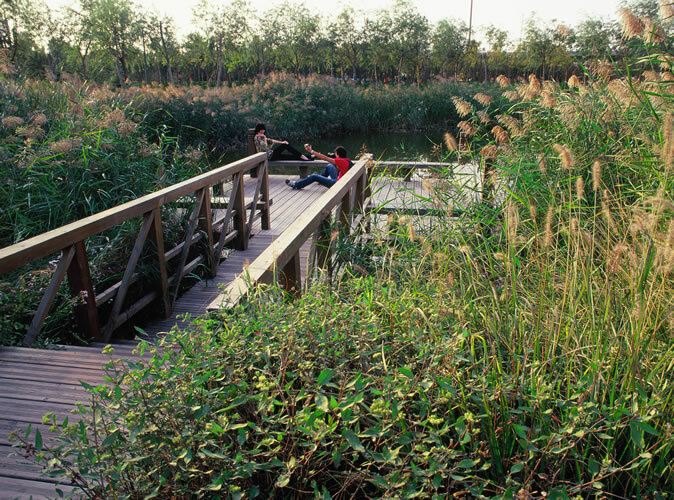 The Qioyuan Park in China’s Tianjin City showcases the ecosystem services-oriented approach to landscape restoration in the middle of a densely populated urban setting. 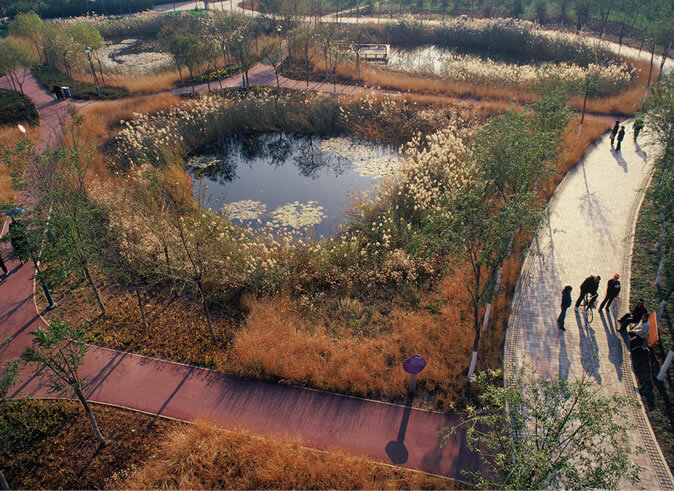 The adaptive palettes of Qiaoyuan Park is a experimental showcase of regenerative design. The redevelopment strategy integrates site topography, groundwater table and native habitat to inspire a design that will rejuvenate nature’s ecosystem services. The project reactivates valuable open space and rebuilds a diverse native habitat that will be able to manage storm water, infiltrate groundwater, and educate the community about the beauty of the native landscape. The site is located in the Hedong district in one of the largest and oldest districts in Tianjin, China with a surrounding community population of 300,000. The 22-hectare site is an abandoned shooting range, transformed into an illegal dump after years of neglect, where storm water from urban runoff draining to the site contaminated the soil and water. Only a few poplar and willow trees had survived and adjusted to the saline and alkaline soil. An informal community was living on the edge of the site but the community was relocated and the buildings were demolished prior to design consultation. 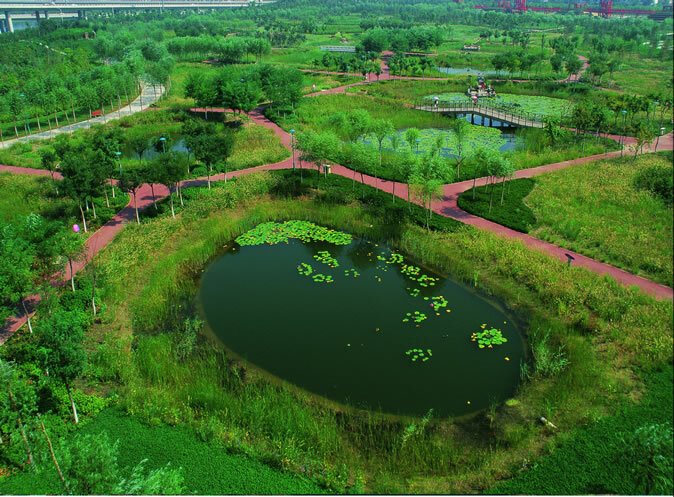 The park is named Qiaoyuan – ‘qiao’ meaning bridge and ‘yuan’ meaning garden – The Bridgepark. The name is derived from one of the few remaining expanses of open space in the area and its location adjacent to the Weiguo highway interchange. The southern and eastern face the community ensuring a strong connection to the neighborhood in the future. 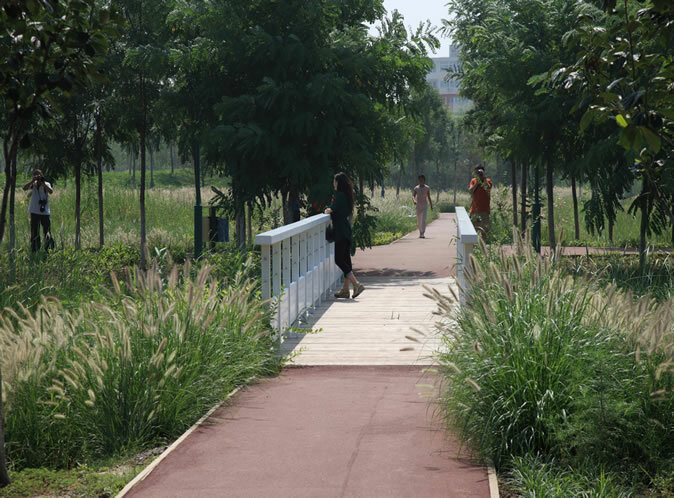 The regeneration of Qiaoyuan Park is part of an environmental improvement program supported by city leaders to initiate environmental restoration using more sensitive environmental approaches. The intent was to build a park that was able to manage urban storm water, rehabilitate and preserve biodiversity, restore and preserve the vernacular landscape, and provide recreation for adjacent communities. The design strategy is simple – let nature perform the role of ecosystem restoration. The approach veered away from conventional solutions and focused on ecologically sensitive design so the park would become an investment for the city as a low-maintenance high-performance landscape. Tianjin is located in the lower piedmont alluvial plain of Haihe River, near the estuary of the Bohai Gulf. The shallow groundwater table and slight changes in topography translate into highly varied soil properties, allowing a variety of plant communities to thrive. Decades of development has destroyed the coastal plain landscape once rich with wetlands and salt marshes. This flat and subtle native landscape inspires the restoration of the degraded landscape in the city. 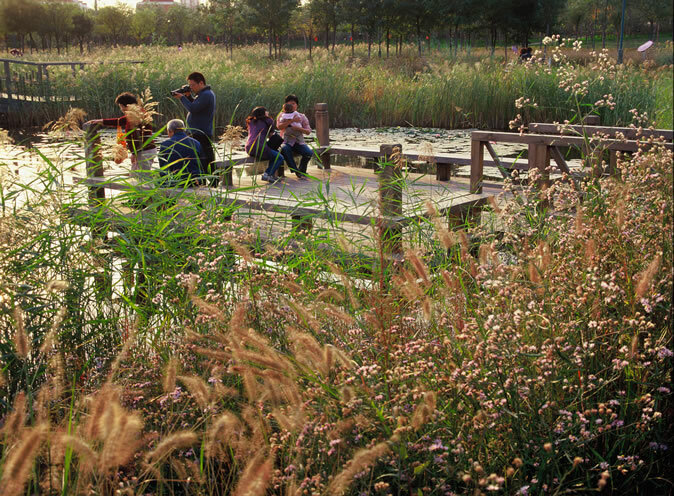 As one of the oldest districts in Tianjin, the landscape is highly fragmented and polluted,. 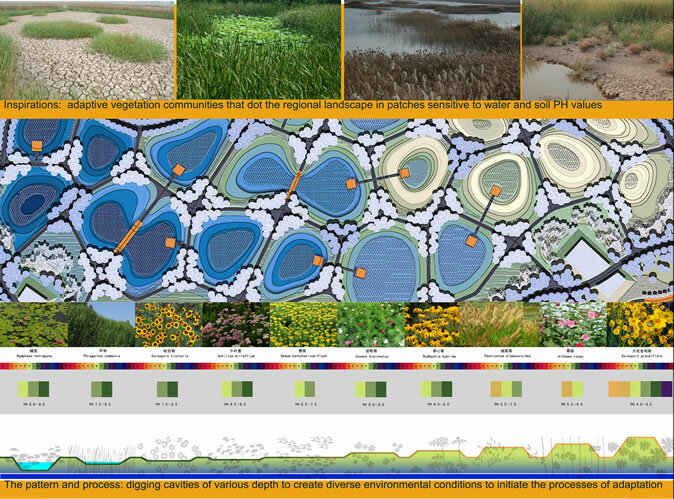 The proposed redevelopment of the coastal wetland landscape has the capability, once again, of performing important ecological roles related to water and habitat management. The location adjacent to a major highway and existing topography inspired the water management strategy for the park. The low site elevation and shallow groundwater table creates a myriad of ecosystems that will evolve and adapt depending on the variations in elevation, pH, and moisture. The ecological functions of the site had been destroyed and the measure of a successful park was the integration of the ecosystems services of provisioning services, regulating services, supporting services and cultural services into the design. The challenge was to rejuvenate ecological processes using the vernacular landscape, to mitigate soil and water contamination, and allow the site to adapt and evolve naturally. The community need for an aesthetically pleasing open space for neighborhood recreation was also crucial to design implementation. (a) The creation of habitats: The first step was to regrade the site to create ponds with various depths for storm water collection, storage, and treatment. Inert onsite waste reclaimed as fill material to create topography. 21 ponds were created with each pond varies between 20-40 meters in diameter and varies in depth. The relative moisture levels and pH of each pond create micro habitats ranging from wetlands to wet prairies and grasslands. (b) Plant community design: The plant community began from seed. The seed mixes were specifically developed for each habitat so a biologically diverse plant community would flourish. The dynamic, self-evolving, and adaptive nature of the design allow species to move and change over time instead of maintaining a strict planting design. Indigenous species are encouraged to become a part of the landscape through wind and bird dispersion. The plant communities will go through several stages of succession as the site remediates and balances the saline-alkaline soil. By allowing the plant community to change throughout the year, the cycling of plants and nutrients begin a natural cycle of growth, pollination, reproduction, and decomposition. (c) Cultural services. The adaptive palettes is the living system and the footpaths create a network of linkages for the visitor. Willow woodlands nestle the ponds and platforms and bridges are subtly designed to submerge the visitor in an aesthetically pleasing landscape of native grasses and wildflowers. Interpretive signage of each plant community is posted at each pond to explain natural processes including the water cycle, ecological benefits, and major plant species. The park becomes a recreational space and instills a sense of stewardship and ownership for the community. This design was initiated in spring 2006 and construction was completed in May 2008. During the first week of opening, nearly 200,000 tourists attended the opening, proving an unprecedented success. Through simple ecological regenerative design, the former unused space had become a new ecological park. Ecological services such as storm water regulating, soil and water improvement, biodiversity maintenance, stewardship, aesthetics and recreation dramatically transformed this space within two years. A powerful landscape emerged by understanding the needs of the surrounding community and employing a new environmental strategy. 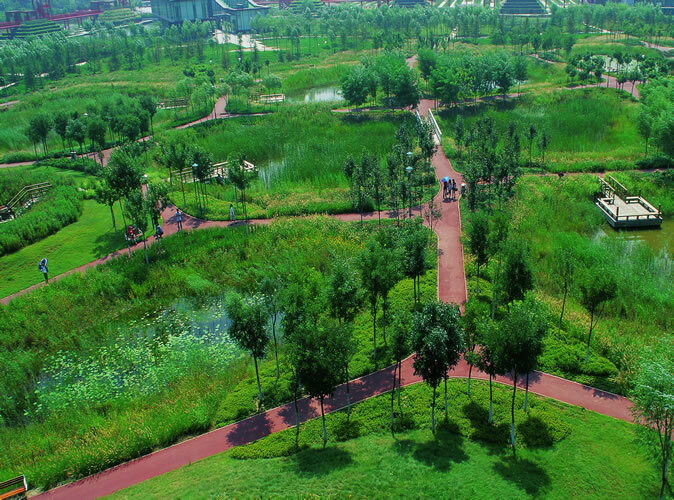 The regenerated ecological park has unveiled a new aesthetic in China – one that adheres to environmental ethics and a heightened sense of ecological awareness that is spreading throughout the world. This strategy reveals a bright perspective for ecological urbanism in design. Nature’s self-recovering ability speaks strongly in this park by illustrating that engineered solutions and highly maintained spaces are not necessary for a successful regeneration program. The designers respected the vernacular landscape and its natural processes to initiate nature’s ecosystem services. Inexhaustible ecological services are gained from this approach and reveal the historic vernacular landscape to the community and the city. Acknowledge: The author thanks Nicole Janak for her review of the article. Additional Project Credits: Shi Chun, Jia Jun, Ji Sheng,Hu Hanyu, Zhang Bo, Su Xinglan, Feng Xianjun, Wang Yunfeng, Lin Li, Zhang Xuenian. Costanza, R .and H. E. Daily ，1992. Natural capital and sustainable development. Conservation Biology. (6):37-46. Costanza, R. et. al. 15 May 1997. “The Value of the World’s Ecosystem Services and Natural Capital.” Nature 387: 253-259. Daily，G.. C，1997. Nature’s Services： Society Dependence on Natural Ecosystems. Island Press， Washington， D.C.
Millennium Ecosystem Assessment (MEA). 2005. Ecosystems and Human Well-Being: Synthesis. Island Press, Washington. 155pp. 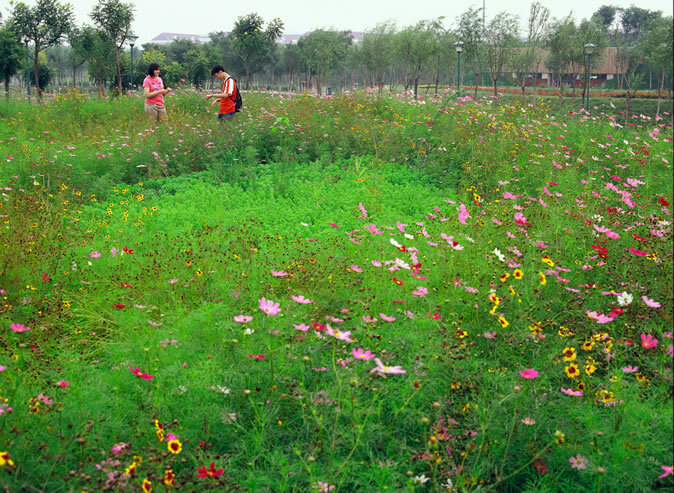 Shannon, K. (2009) ‘Can Landscape Save Asian Urbanism?’ Landscape Architecture China, October 2009, p. 39-45. 2007, Yu, Kongjian a; Mary G. Padua, China’s cosmetic cities: Urban fever and superficiality, Landscape Research, Volume 32, Issue 2 April 2007, pages 255 – 272. 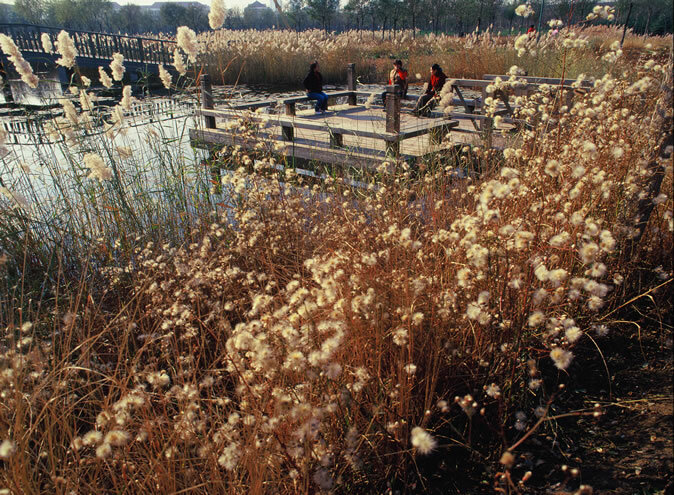 2006, Yu, Kongjian, The Art of Survival: Recovering Landscape Architecture. In: Yu, Kongjian and Mary Padua (Eds. ), The Art of Survival, The Images Publishing Group, Victoria, Australia, pp.10-25). 2009, Yu, Kongjian, The beautiful big feet: Toward a new landscape aesthetic. Harvard Design Magazine 31, Fall/Winter 2009/10: 48-58.